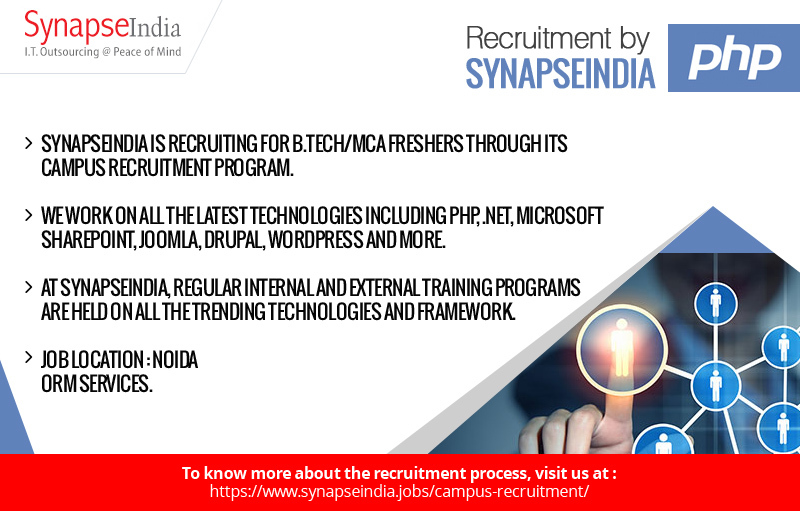 SynapseIndia Recruitment team is hiring for B.Tech/MCA freshers for the profile of PHP Developer through its campus recruitment program. The job location for the profile is NSEZ, Noida. Under the guidance of Shamit Khemka, SynapseIndia has emerged as a foremost IT solutions provider in India. The company has been rated as best place to work with by SiliconIndia. There are clients from more than 30 countries who have outsourced their IT projects to SynapseIndia. We work on all latest technologies including PHP, .NET, Microsoft SharePoint, Joomla, Drupal, WordPress and more. At SynapseIndia, there is a great career growth for all employees. Many professional who joined us at initial level are now leading a team.